I’m so excited about today’s post! Finally. I’m finally sharing my organized pantry with you! We’ve now lived in our new home over four years and this pantry was for the most part organized one month after we moved in. WHY haven’t I already shared this space!? I honestly have no idea! Ha. But I guess it doesn’t matter because I’m sharing it with you now. 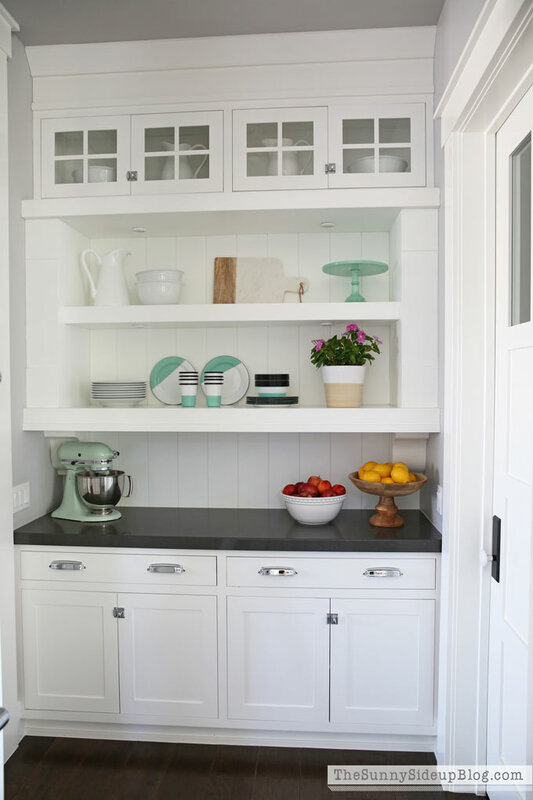 :) What I have shared multiple times is this butler’s pantry (the counter and open shelves in my kitchen that links my pantry and the formal dining room). See that door to the right? Let’s go inside! 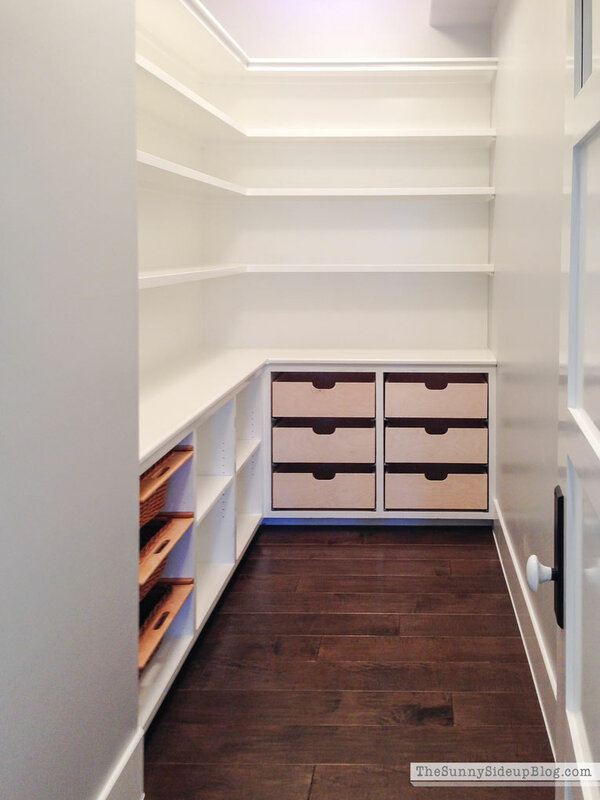 When I was working with our architect to design my pantry he kept trying to make it bigger. I kept explaining that food/cooking wasn’t really my thing and after living with my previous pantry, anything I could walk into would be plenty big and would feel like a dream! 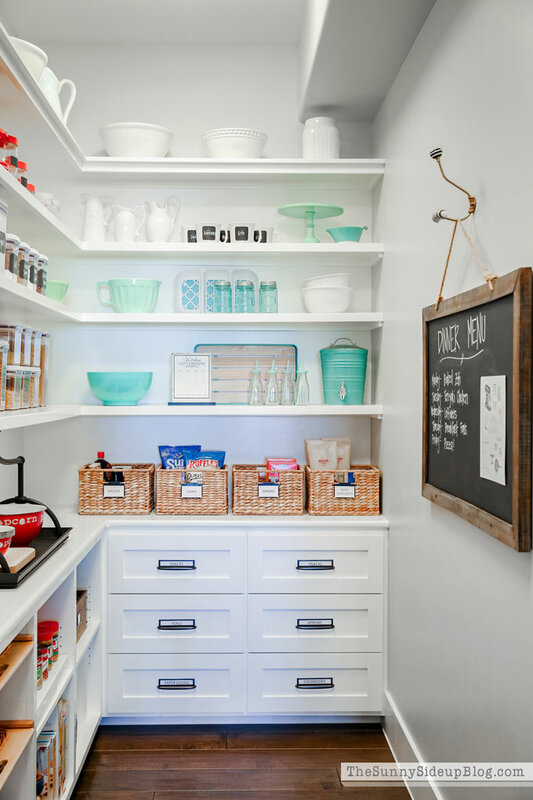 A few things that were on my pantry wish list: regular drawers, pull out basket drawers, open shelving for food, open shelving for kitchen accessories, counter space and wall space to hang a few things. Done and done! I am so happy with how it turned out and feel grateful for this space every single day. This is a picture of my pantry soon after we moved in. Initially I was going to keep the drawers open like this but then a few months later I decided I wanted to put drawer fronts on them. Hardware and labels please! My carpenter made the drawer fronts and I found these label pulls at Pottery Barn. (They don’t sell them anymore which is so sad because I love them! I used them in our playroom and Kole’s room for drawers too.) I printed labels for SNACKS, FOILS, PAPER GOODS, APRONS, and COOKBOOKS. I keep snacks for the kids in the top two drawers. This makes lunch packing and snack time a little easier. I shouldn’t say these drawers are just for the kids. I’m the one who has always been popcorn obsessed. 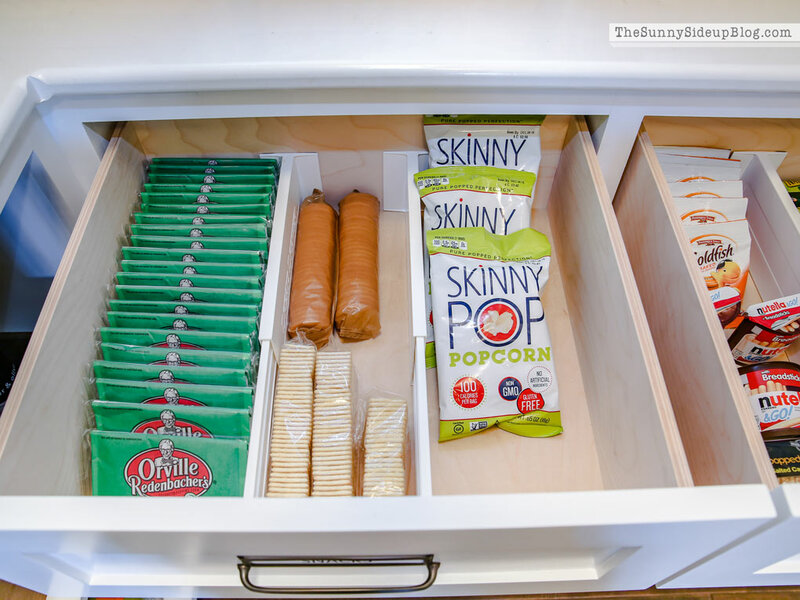 I use these Dream Drawer Dividers to organize our snacks. LOVE these. Another favorite organizer I have all over my house! You can see how I use them in closets here. 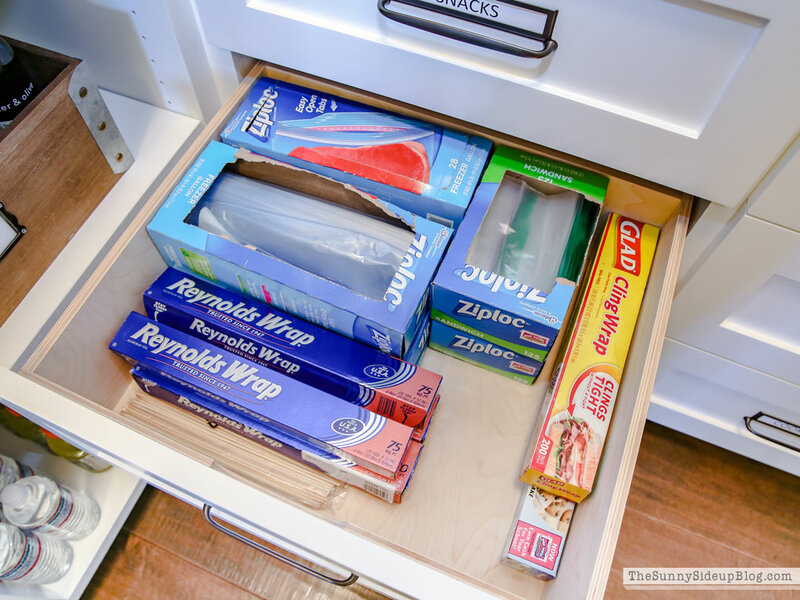 This drawer holds foils and ziplock bags. Moving to the left side of the pantry! I use the top two shelves for more miscellaneous kitchen items (bowls and things I only use once in a while). And the next two shelves for baking products and food we reach for often. 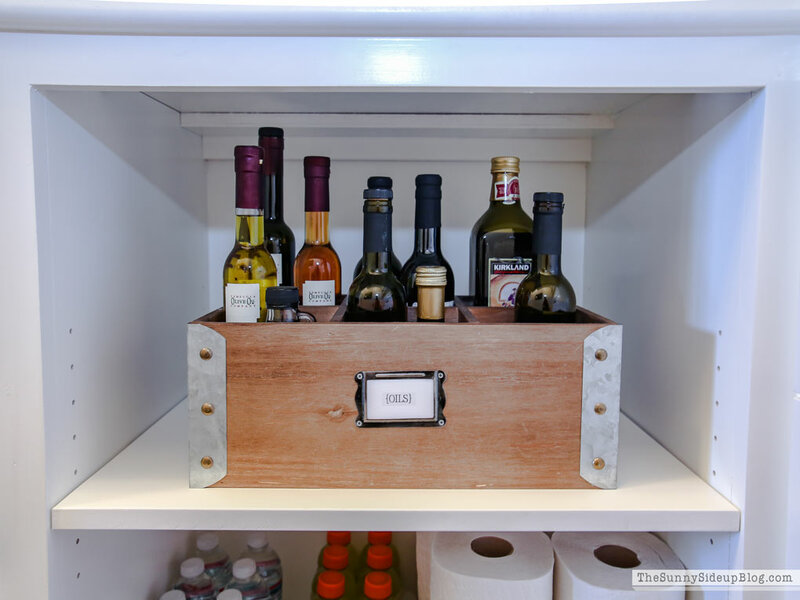 The counter in my pantry is one of my favorite things and has come in so handy! 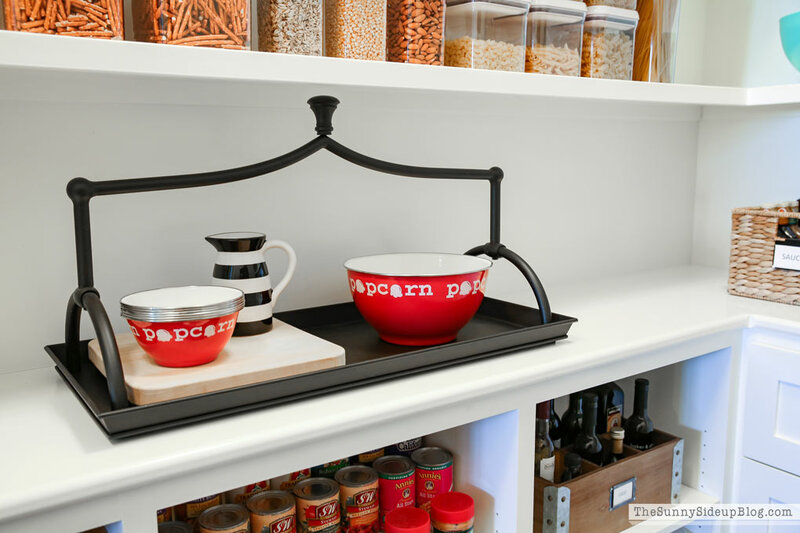 I often have my black tray and our beloved popcorn bowls slid to the side. Then I have a clear counter to set my grocery sacks and food on after a trip to the grocery store while I’m putting everything away. Let’s talk about the magic happening below the counter. SO nice having these open shelves for larger items. I use this Expand a Shelf in the middle to store canned goods. I love that you can adjust it to fit any space. The bottom shelves are for any extras. This wooden crate was a random Home Goods find and works perfectly to hold all of our oils. They can get sticky so I always like having them in some sort of tray, basket, or crate. Then there’s my pull out baskets. I told my carpenter about these (I had seen something similar in a magazine) and it took him a while to find them but he finally did and built them into my pantry design. They have a plastic lining on the inside so they are great to store food and wipe out. 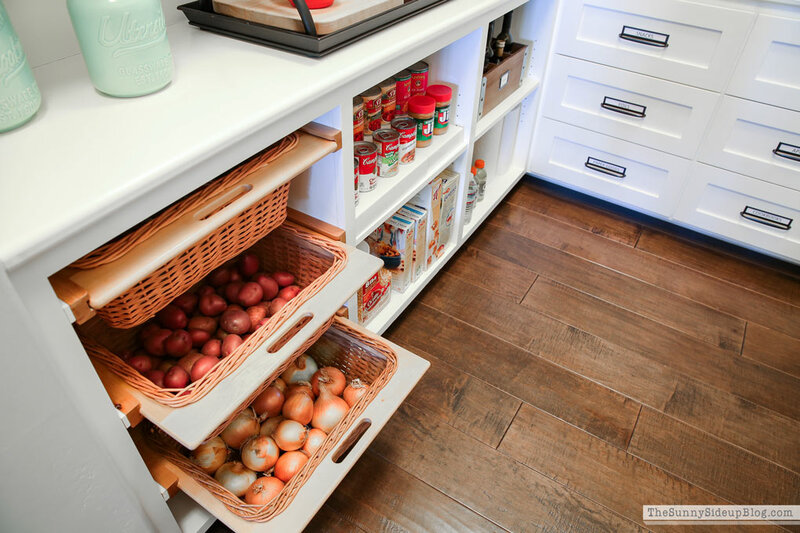 I use the top drawer for bread and the bottom two for things like onions and potatoes. And no.. we don’t usually keep this many onions and potatoes on hand! I filled them for the BHG photoshoot and then was trying to come up with creative ways to use them for quite a while. Which basically just meant lots of potatoes with onions. My culinary skills are impressive I tell ya. Ha. 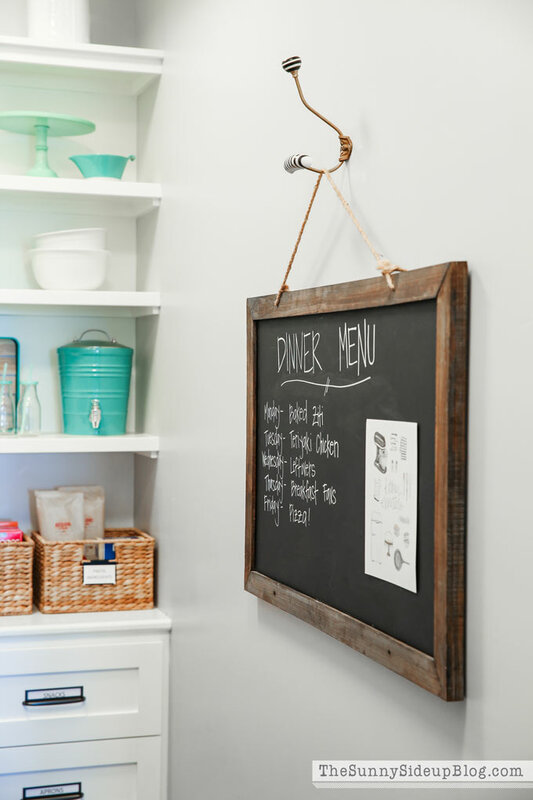 When I bought a large chalkboard for my office I loved it so much I decided to put the same thing in my pantry. You guys.. I had such great plans for this chalkboard! 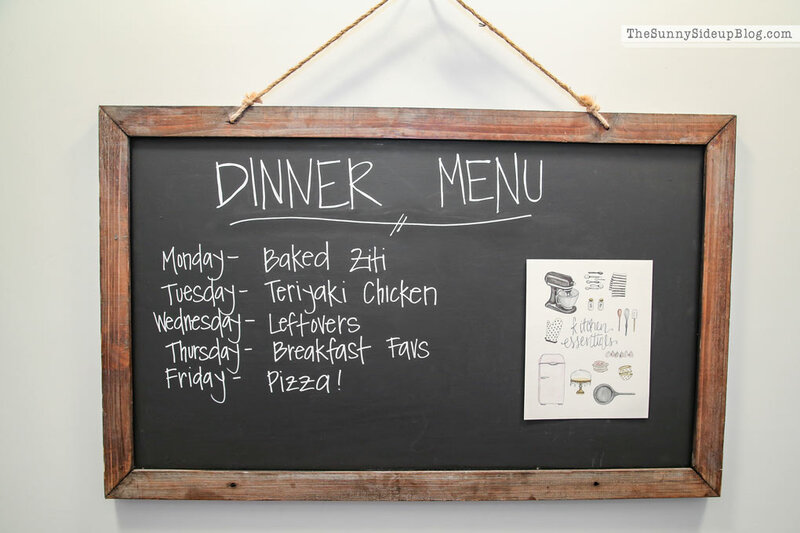 I was going to start meal planning and writing the week’s menu on this chalkboard. Every Sunday night! I was going to be planning those meals. Guess how often that happened? When the BHG crew was here taking pics of this space they suggested some meals I could write on the chalkboard. Some of the meals they suggested sounded so fancy and I seriously hadn’t even heard of them before! I laughed and told them there was NO way my blog readers would buy that I was cooking all that. So they said ok.. just write what your family typically eats during a week. So I wrote the menu above. I didn’t dare tell them that this was a good cooking week for us. Baked Ziti AND Teriyaki Chicken the same week? That’s my A game. And I haven’t touched this chalkboard since. We may not always enjoy the finest of dinning around here, but this pantry has served us well and works great for our family. 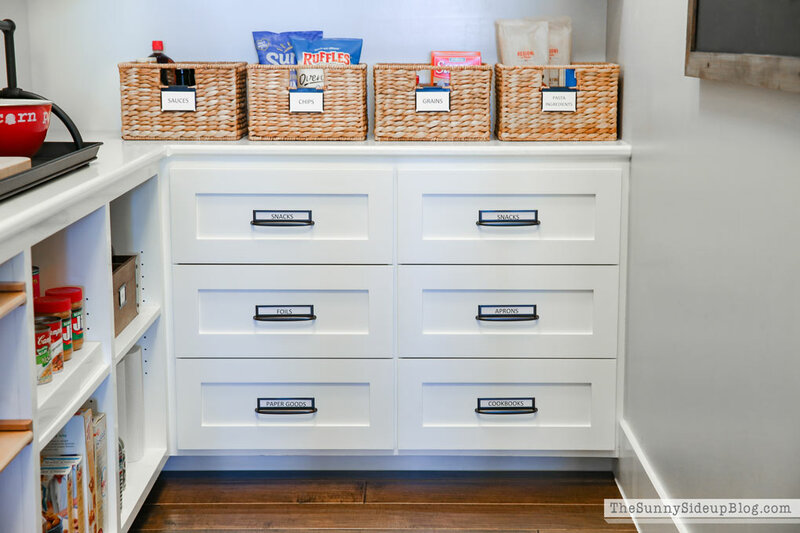 On a sidenote, if you are struggling with pantry organization I’m going to write a post that covers some tips I’ve learned over the years! Let me know in the comments if you have anything you want me to address in that post. All pantry sources are below! Also below that I’ve added some links to all the fun things I’m scoping out that are on sale this weekend for President’s Day. So many great deals. It’s a good weekend to shop! 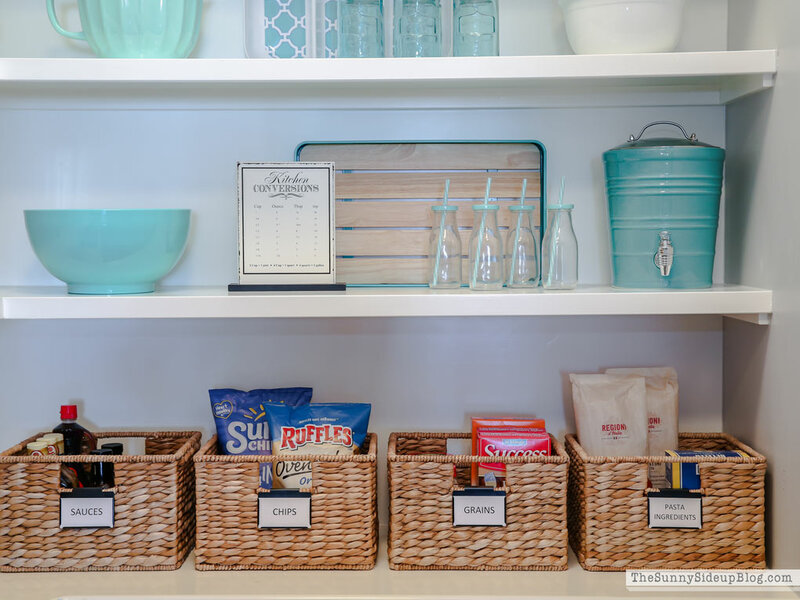 Or to organize your pantry! Or both! Or neither. This post might be my favorite of all time. Our pantry is the bain of my existence – both because of the food in it and the lack of organization! So, thank you for keeping it real on what food is actually in your pantry at all times. No specific requests because I don’t even know where to start, but man, I look forward to your tips post. Also, your meal planning is like mine, so hi fives on that A-game. Love love love your pantry! Our space is definitely not as big and i’m always struggling for room. I generally keep it pretty organised but I am SO SO bad at keeping things past their expiry date. Do you have any tips/tricks for managing this? That is such a nice space! The menu board is a great idea. I have always made up a menu for the week before I go shopping then I know exactly what I need to buy for ingredients. 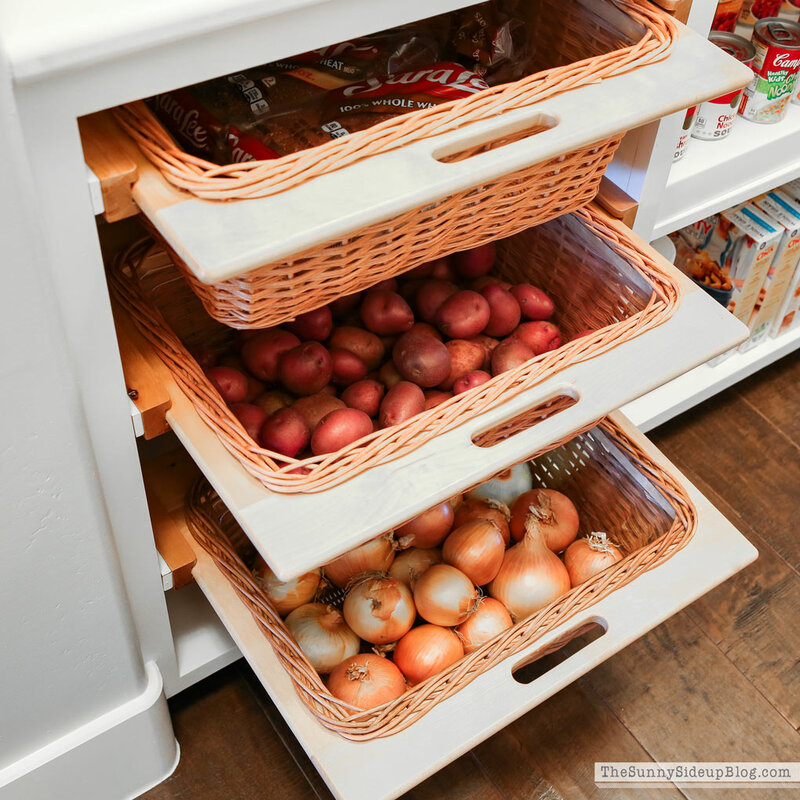 I love the onion and potatoe drawers! I have a problem with labeling things. I label containers even when you can see what goes in them! It’s a big joke around here. My biggest problem I have is under my kitchen sink cabinet all my cleaning products! I have to say it’s a mess. It’s the only cabinet I can’t seem to get a grip on it. Any ideas? I need motivation for that space. Ha Ha! 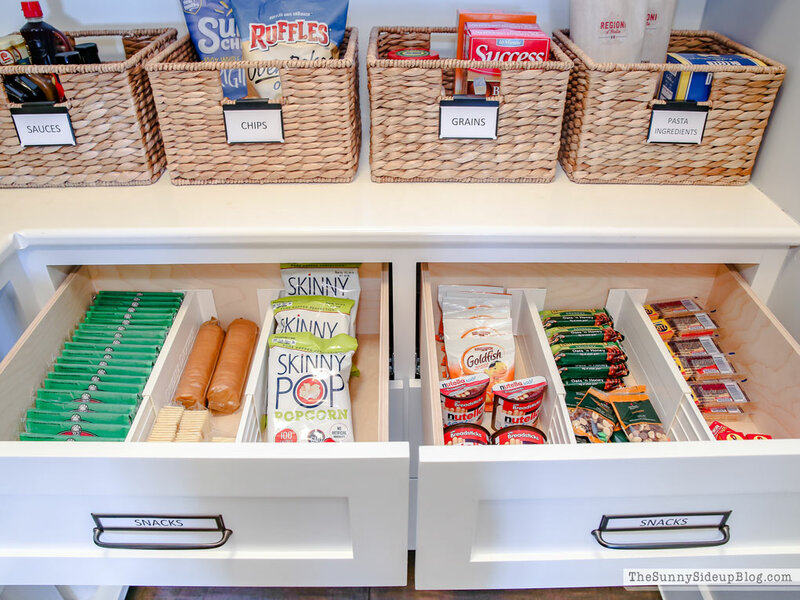 I adore your pantry!! One question—where do you put the large items like flour and sugar that didn’t fit into your containers? Food storage stuff…..
Oh my GOD Erin, I think I’m going to faint! Thant pantry is bigger than my living room! So neat, looks like a dream come true, thanks for sharing!! What are the dimensions of the pantry??? Hi Emily! It’s about 12×6! You are seriously so cute Erin! 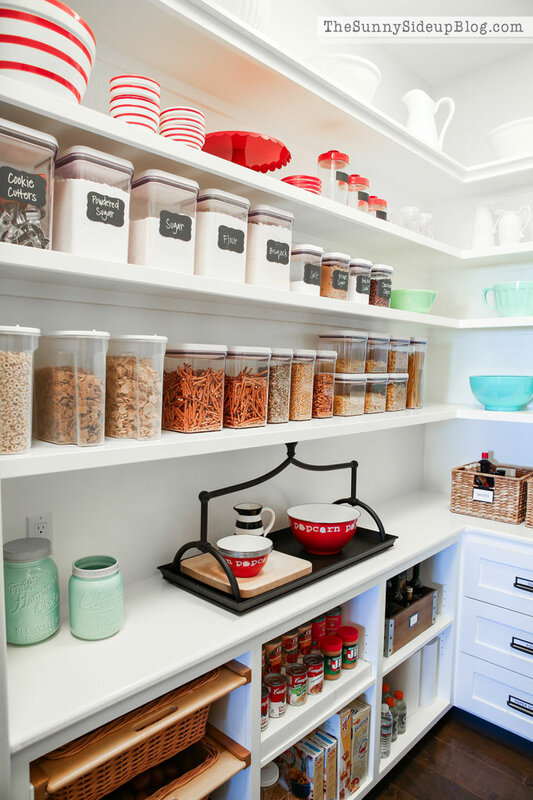 LOVE your pantry, that is a dream! Puts my tiny pantry to shame! Hope you enjoy your extra day of no school carpooling and enjoy this fabulous weather!! It all looks lovely & so organised. Good Grip storage jars etc are great. You store emergency food storage items etc? I know in some houses in Utah that they often have a special room for it., not sure about California etc tho. 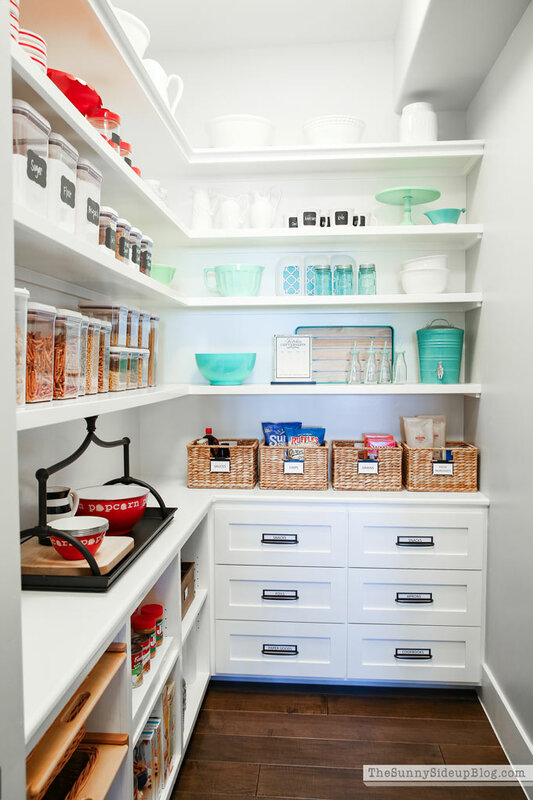 Your pantry is what I dream of someday! And I honestly love that you showed what’s really in there. Above my fridge currently has Costco size chip bags that make me cringe. I would love to hear any tips you have on a small cabinet style pantry that’s deep. I loose things in the back even with bins I use. thanks so much for sharing your pantry with us!! 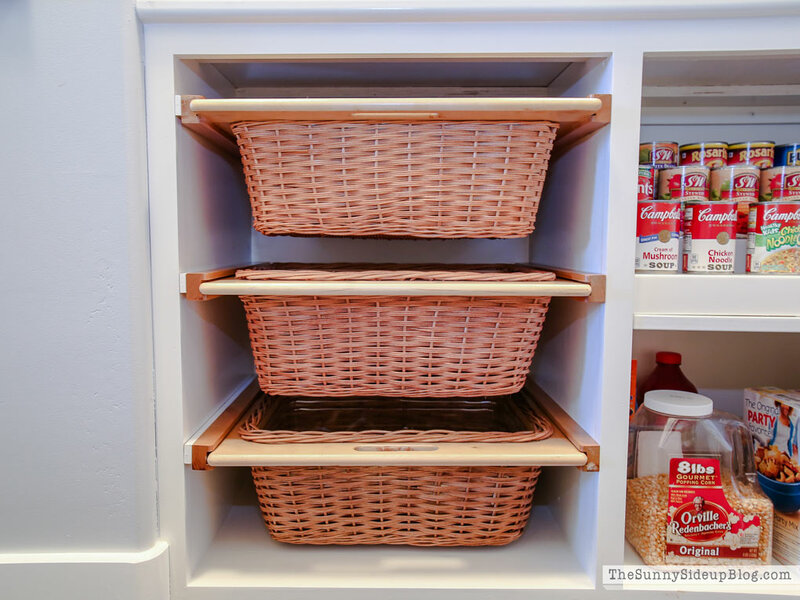 I really like the idea of the built-in baskets especially for breads and veggies that you don’t want out in the light. this space is totally magazine worthy :-) and worth the wait! 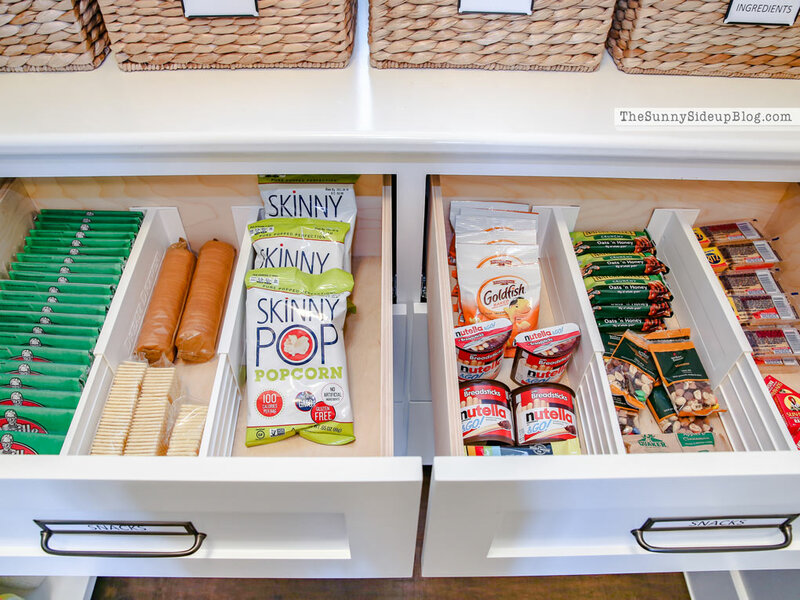 I absolutely adore your pantry, Erin! 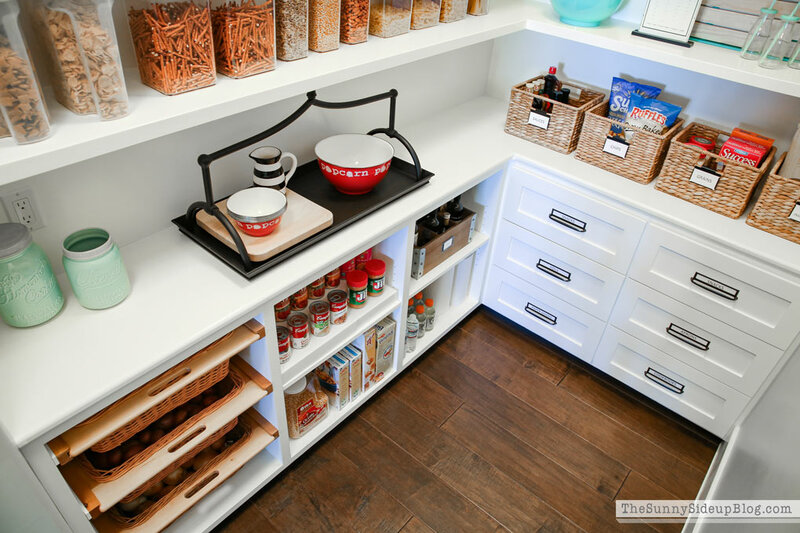 My pantry could easily be the pantry in your previous home….very small but works for us. I, too, am pretty good about keeping that space organized. My hubby does a lot of the grocery shopping (yes, I know I’m very lucky), but I usually grab the things that go in the pantry and put those away so it stays more organized. I’m sure I have more food in my pantry for two people than you do for five, but I’m one of those strange people who actually enjoys cooking and cooks quite a lot. I think your open shelves are so pretty with a mix of food items and some pretties. Thank you so much for sharing! Erin, you’d have a fit if you saw my tiny pantry! It’s probably 1 m wide :) I should take a pic and tag you on Insta. I like it though because it forces me to keep it organized. These are great! Has the BHG shoot been published yet? If not I look forward to reading the article! My pantry struggle is the size- I am not sure why the builders made our pantry so small when our house is a decent size. Our pantry is tall and deep! This is a terrible picture but I have a pic of the bottom half of my pantry here- DEEP! I typically have baskets in the front and backstock behind them. The top half of the pantry contains those same Oxo containers but again they’re like 4 deep and it’s like fishing and moving to get to the one I want. http://mealtimemenu.com/index.php/2017/12/31/january-1-8-2018/. And I just ordered a Marlo rug in Navy blue for my boys’ bathroom! Thanks for the heads up on the sale! LOVE your pantry Erin! I’ve been SO excited to see this!!! 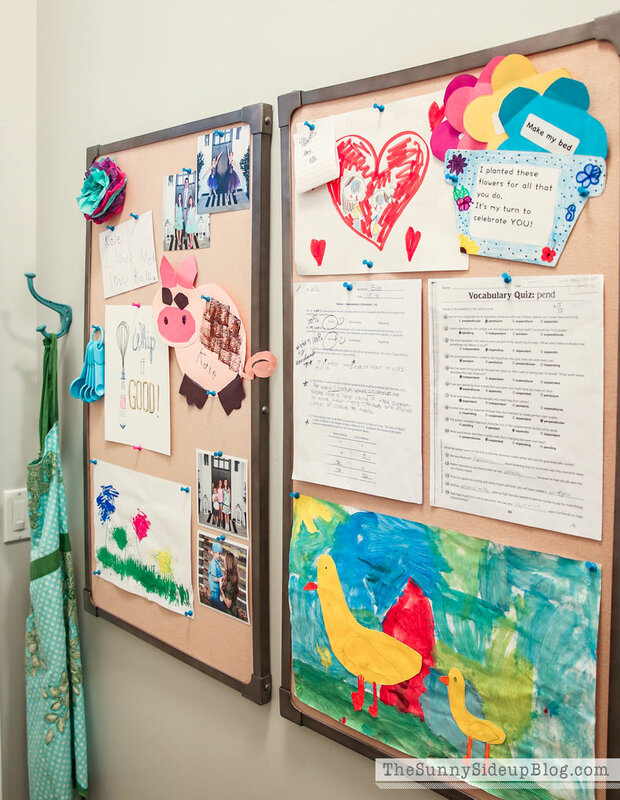 I love the corkboards and the pull outs for the potatoes and onions! Also those drawer dividers you recommended from the Container Store. I bought some when we moved into our house for our dresser drawers and they have been amazing game changers!! Thanks for sharing this room! OMH I LOVR YOUR PANTRY!!!!! Love the floor , can you share what it is we are putting in new flooring in a month . 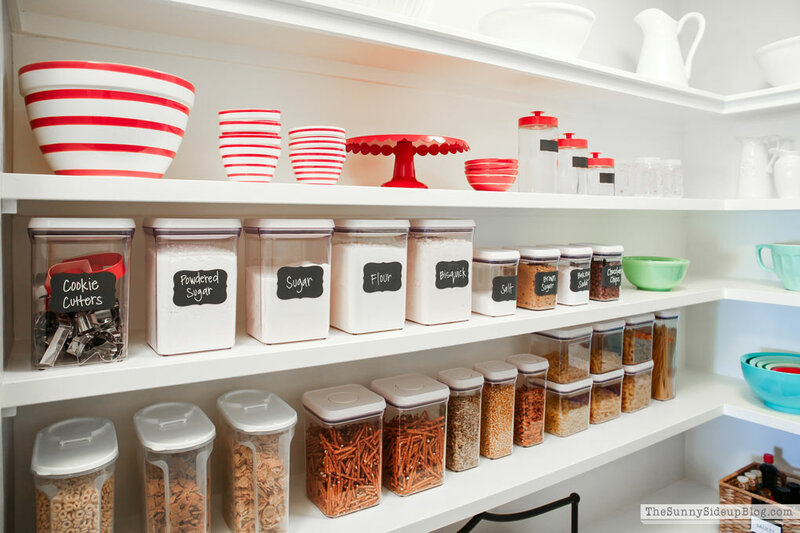 Love your organized pantry!!!! 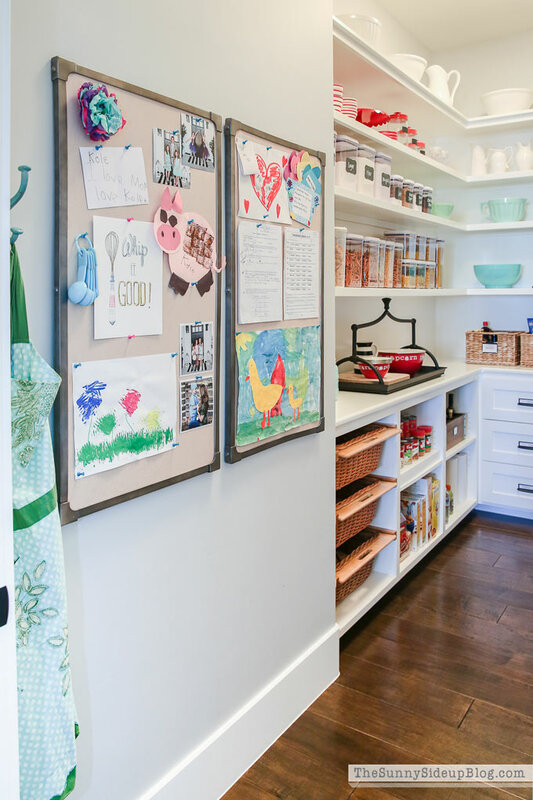 Where did you get your artwork -whip it up and kitchen organizing???? Hi Erin! Where did your carpenter find the pull-out baskets? They’re awesome! Thanks for sharing! This is awesome!!! I love looking at others pantry and fridges lol arnt we nosey!! Such a fun post! As much as I love organizing, our pantry has always been a struggle for me. It’s small, and the shelves are skinny across the front and are really deep. (Hope that makes sense!) Any tips or ideas? Love the paint color in there! Is that the same color used throughout most of your house? I love the pantry! 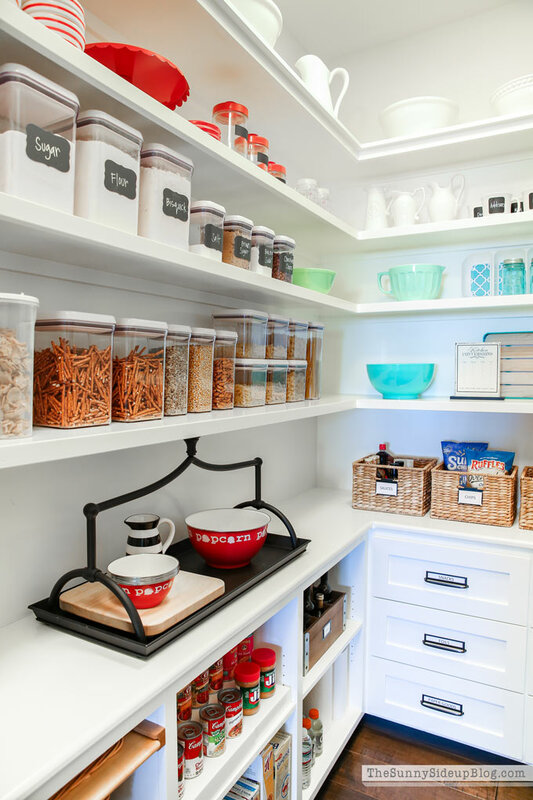 I am like you in that without an organized pantry, I can’t function properly! My problem is that no one else in my family puts anything back in the pantry properly. 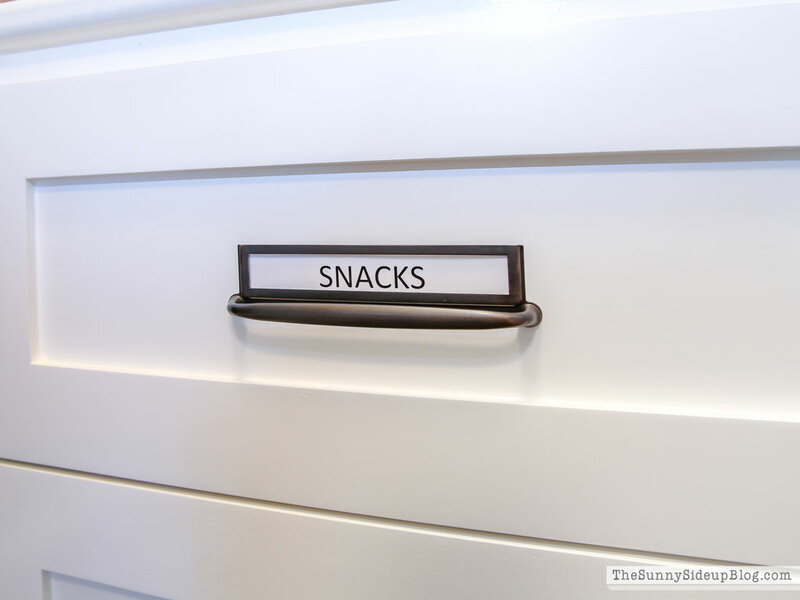 I have a large sized pantry with things labeled, and I have tried to make the organizing easy. But no one bothers. Please help because I am going to lose my mind. 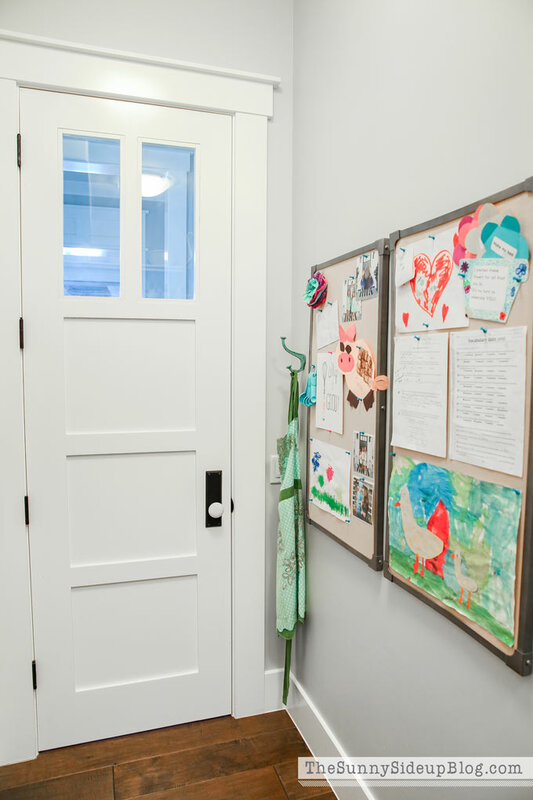 How do you get your family on board with organization? Cereal?!?? And appliances that plug in like the toaster. Our pantry is builder grade and has awful wire shelves. I want to update it badly but needed ideas. I love this post- mostly because it’s SO REAL. Most of us aren’t whipping up gourmet meals every night and just need a pantry that works for normal lifestyle. 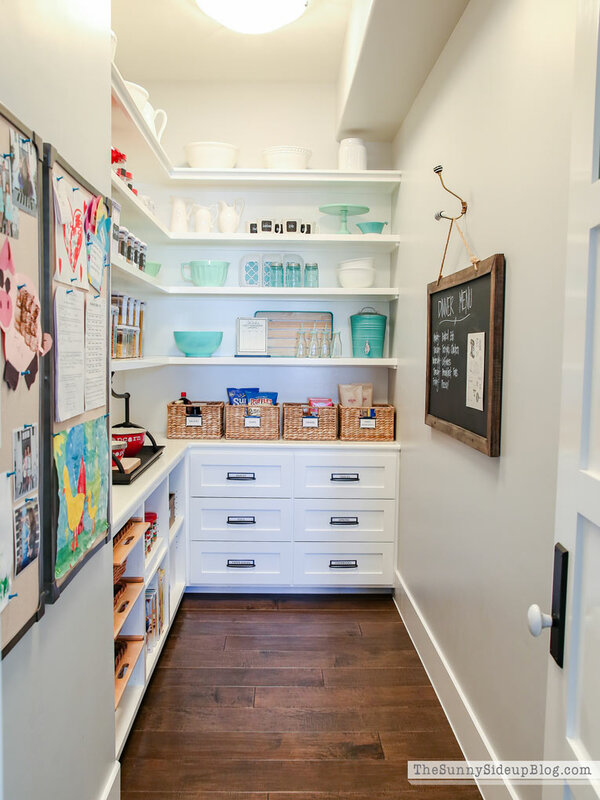 This is totally my dream when we build our home next year, to have an actual walk in pantry with space like this. 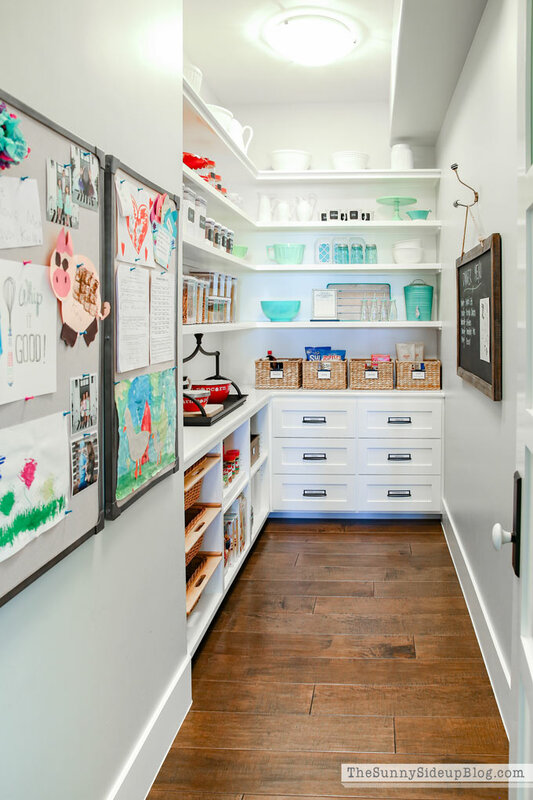 I love the drawers especially-those are perfect for corralling all the “stuff” we use so much but yet gets so lost on shelves easily. Wow! 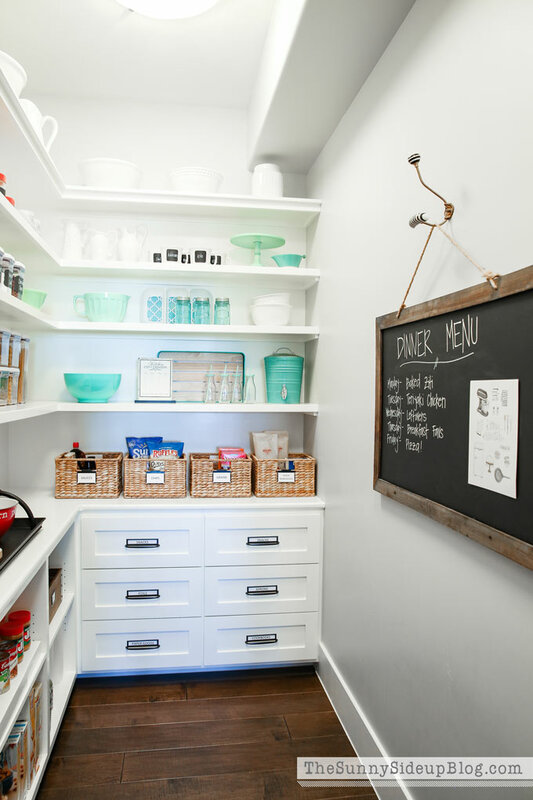 Your pantry is so beautiful, Erin! 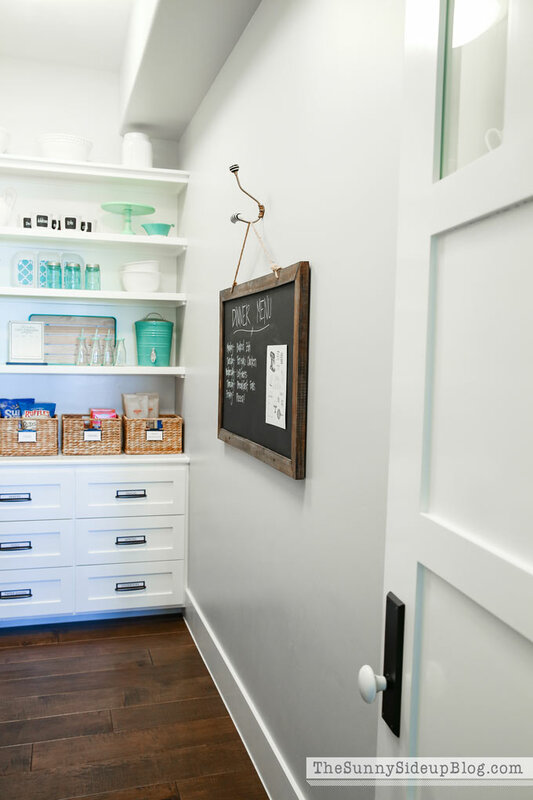 I also love, love your butler’s pantry area that leads into the walk-in pantry. Being in the process of having my own house built, while super exciting, has also left me feeling so drained. Each time I see a new post from you I get to have a few moments of peace, kind of like catching up with a friend :-) You also inspire me to think of my future house as a home, and not just a series of decisions and excel spreadsheets, ha! 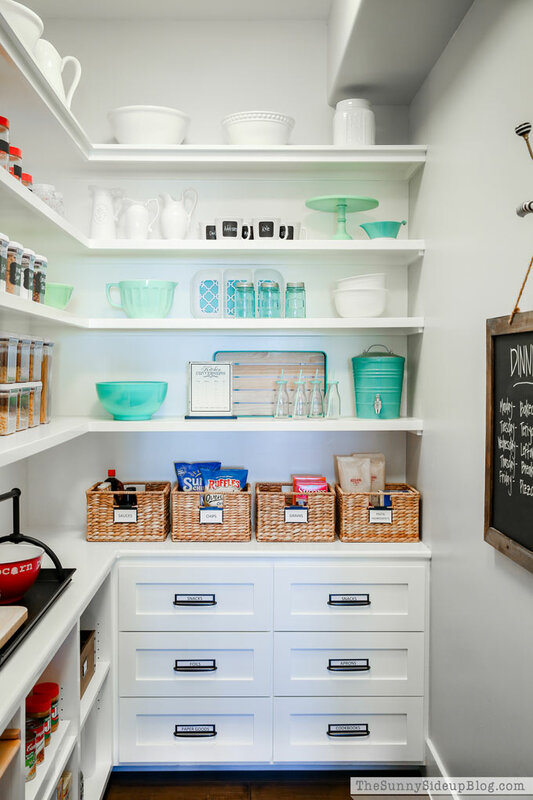 Love this pantry and the rest of your beautiful home! I have an almost walk in pantry with dreaded wire shelves, would love to hear some ideas on this. You are just too funny Erin! Love your comment on the menu plan, and I would have to say I’ve tried this method too. I kept my menu plan on a spreadsheet and it did work for a while but somehow it dropped off the face of the earth. The hubs isn’t complaining that there’s no menu plan so why ruin a good thing? Haha! 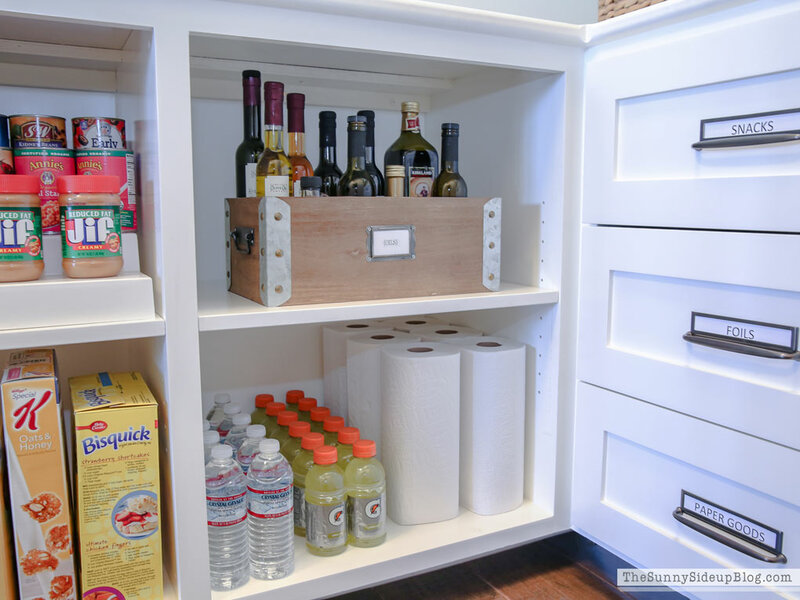 Your pantry is amazing! There’s still so much room to spare. Our pantry is similar to your old one and it’s still the wire shelves that I can’t stand., and we will be in our house for 6 years now. 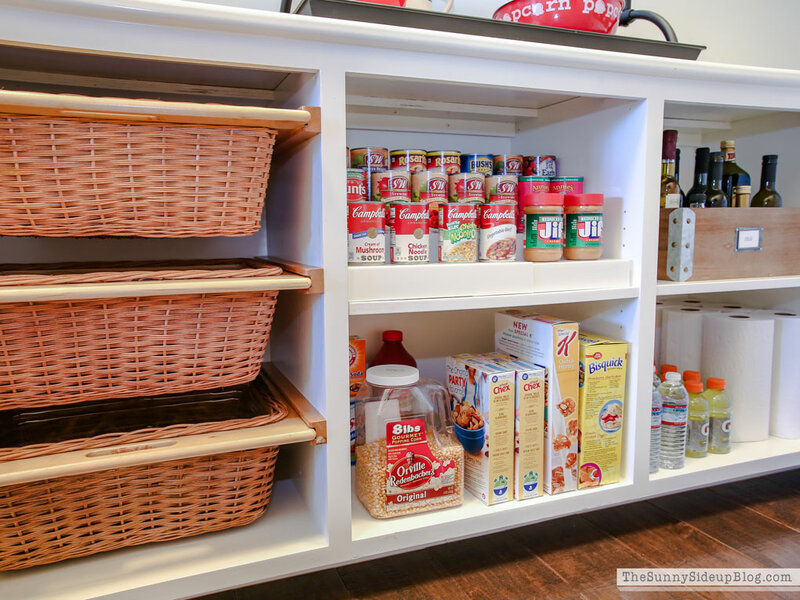 I’ve organized it by using baskets, OXO containers, and also use large canning jars for flour, sugar, grains, etc. I still think our pantry is so packed though and I don’t know how else to make it more pretty. The extra stuff that doesn’t fit in my jars are also in the pantry and placed in the very top shelf where I put things we don’t use all the time. 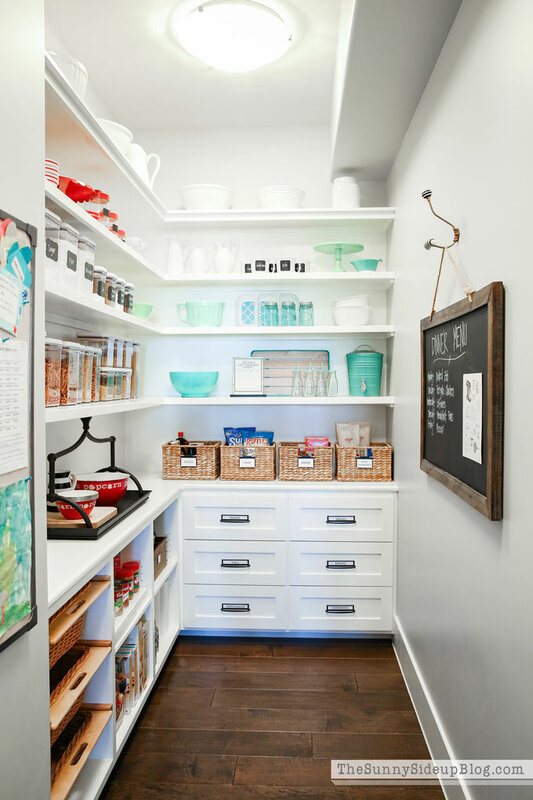 A walk-in pantry would be a dream to have! Great pantry! Where did you get the iron tray that the popcorn bowls are on? Wow! Love your pantry! 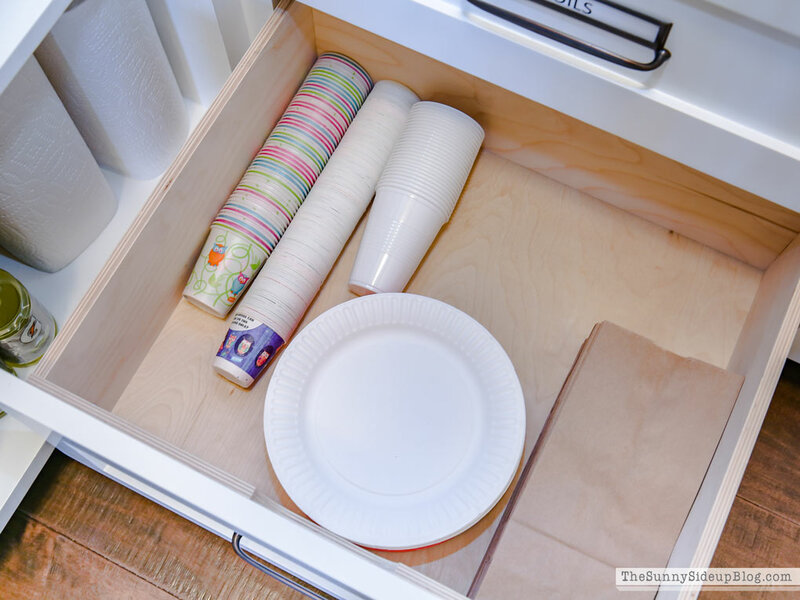 I love what you use the drawers for. While I have wood shelving in my pantry, any ideas on how to incorporate drawers if they’re not already installed? Loved the peek into your pantry, Erin! 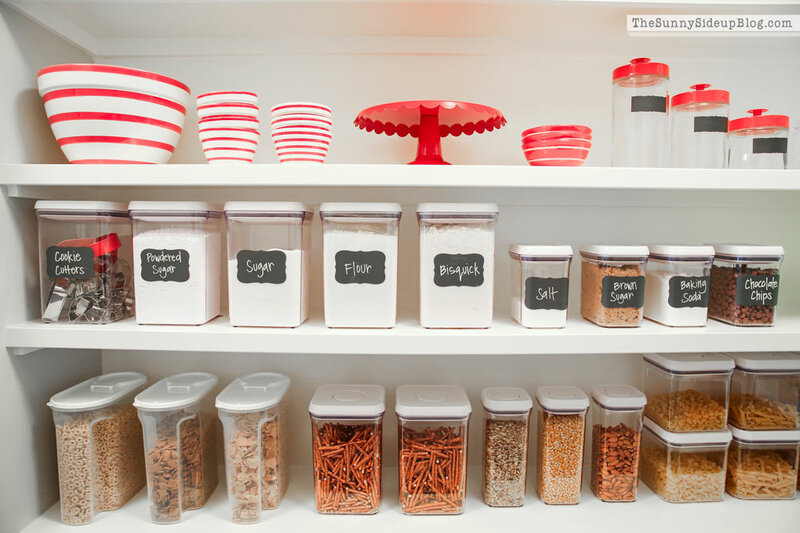 I looked back at your previous pantry, too, and it was fun to see those clear containers still being put to good use. :) You mentioned in that post that you were house-hunting (back in 2011). Obviously, you guys decided to go the building route, so I’m wondering if you’ve written about that decision process? My husband and I are in a constant state of indecision about whether we’re actually going to build on the lot we bought, sell it and buy a house that’s bigger than our current house (which would be less expensive than building), or just live in our current house forever (which we could potentially pay off before our oldest graduates, but is a little too small for our family). Ha! As soon as I decide to do one thing, I wake up the next morning and feel undecided all over again… Don’t get me wrong, I’m so thankful for the home we have, and I know we are blessed to have it and to even have the other options available to us. It’s just hard to know what the best thing is for our family. So many factors… Just wondering if you guys had a hard time deciding what to do as well. Thank you Jenny! Oh my word.. it’s such a hard decision to make! It really is. We had a hard time deciding too. We knew we couldn’t stay in our last house because it was small and as our family grew we were bursting at the seams, but my husband didn’t want to build. We looked at homes for years and just couldn’t find what we wanted in our area so when some lots came up we decided to build. I’m glad we did it now, but it was a rough and stressful two years while we built this house. My husband never wants to do it again! If you can find a home you love that’s bigger and make it your own that would be my advice just because it will save you so much money and hassle. But if you do decide to build read the post I wrote below and hopefully it will help! 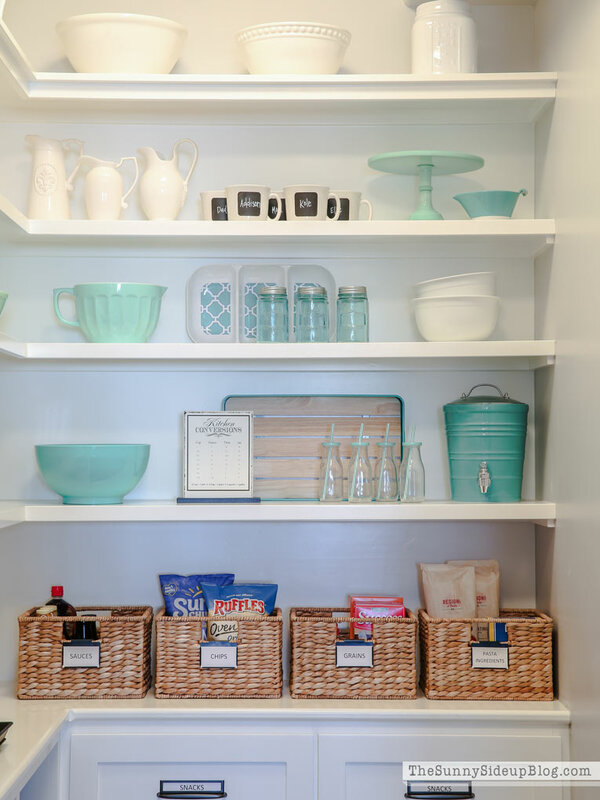 Such a pretty pantry Erin! 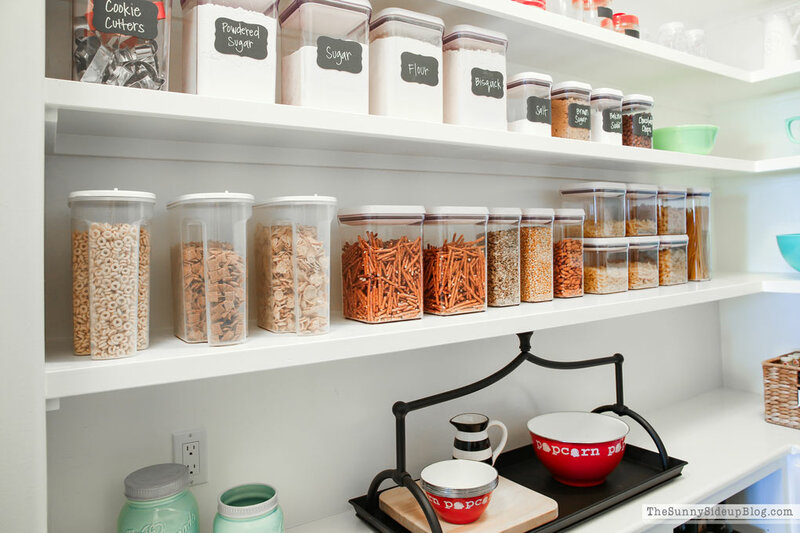 It is just so sad that you don’t cook with such a big pantry! I would love one that big! I would love to know about your small appliances also. I’m in new construction with a large pantry, second fridge (6 kids), open and closed cabinets, bake center with counter but still struggle with toaster, blender, various sized crock pots, waffle maker, mixer, food processor etc. Maybe a post on small appliances? I also keep my cordless Dyson and mop in long wired cabinets in the pantry and I’d love to know where you keep those? Laundry? Mud? Oh goodness Erin, if I had that pantry I think I might just never come back out. You did an incredible job on it…bravo!! Beautiful pantry!!!! 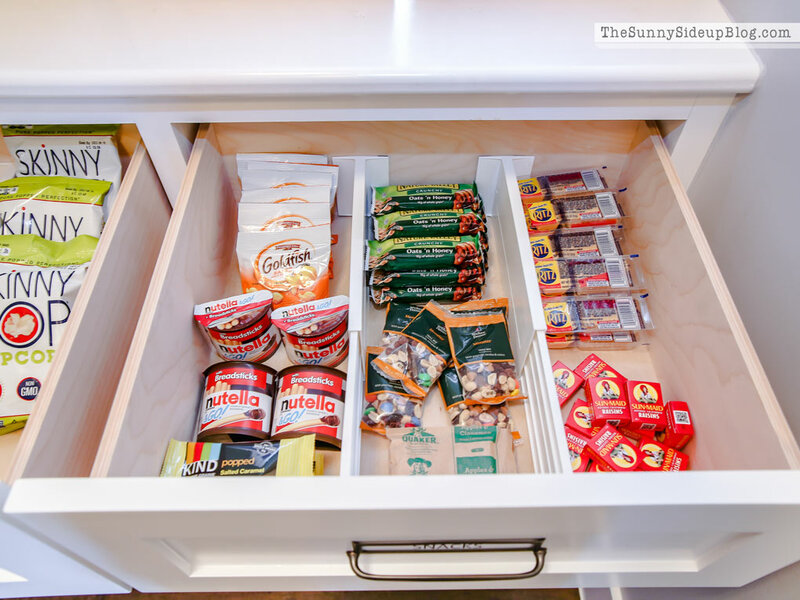 I’d love tips for keeping a super super small pantry organized, especially when you don’t buy the same exact food each week so it’s always changing a bit. Do you happen to remember the sizes of the OXO Good Grips containers you use? Our local stores don’t carry them so I’ll need to order them online…and was nervous to order the wrong sizes for my flour, sugars etc. Love your blog and your organization style! I was wondering how do you organize your spices? I use a lot of different spices when cooking and they end up taking so much space in my pantry and are an eye sore! I would love any advice you have. Thank you! Awesome! ill be looking forward to it :) Thank you! I want to live in your pantry! Beautiful!